In New “Avengers” Image, The Focus Is On Thor. | The Cineaste's Lament. ← Wandering Through “John Carter’s” Mars. There’s been plenty of action in Avengers-land this week as the buzz builds towards this spring’s release of the Joss Whedon-helmed superteam flick. 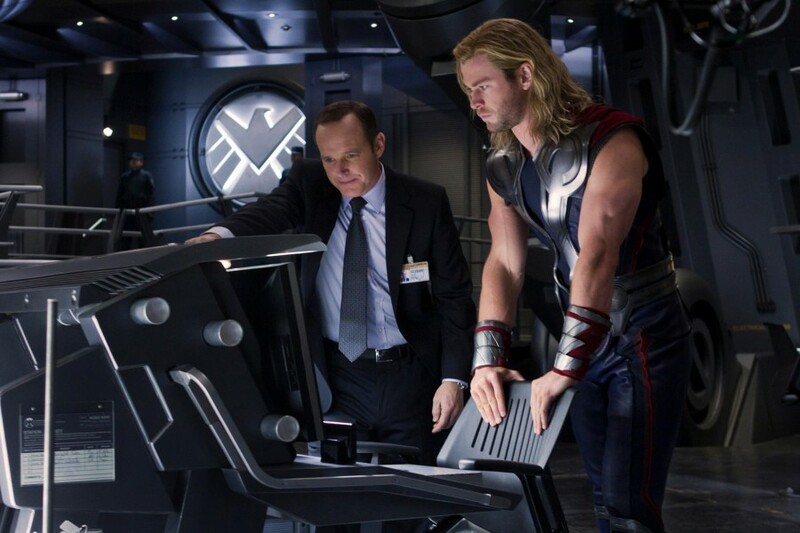 So to keep the momentum going, here’s a shot of Christopher Hemsworth (Thor) and Clark Gregg (Agent Coulson) conferring seriously on something-or-another. If you saw last year’s “Thor” then you probably remember that there’s a bit of a history between these two characters. It’ll be interesting to see how that shakes out. The Avengers is released May 4. This entry was posted in action, Film News, Spoiler-itis, Summer Blockbusters, Superhero Cinema and tagged Chris Evans, Chris Hemsworth, Clark Gregg, Joss Whedon, Robert Downey Jr., Scarlett Johansson, The Avengers, The Avengers promo photos. Bookmark the permalink.